Discover a different side of Athens. Visit the remaining ruins of the Byzantine Empire and learn how all eras and religions coexist in the city. A family friendly tour of the glorious history of the Byzantine Empire through distinct monuments of Byzantine Athens. 1st stop: We will begin our visit from the church of Panaghia Kapnikarea. It is estimated that the church was built sometime in the 11th century, perhaps around 1050. As it was common with the early Christian churches, this was built over an ancient Greek pagan temple dedicated to the worship of a goddess, possibly Athena or Demeter. 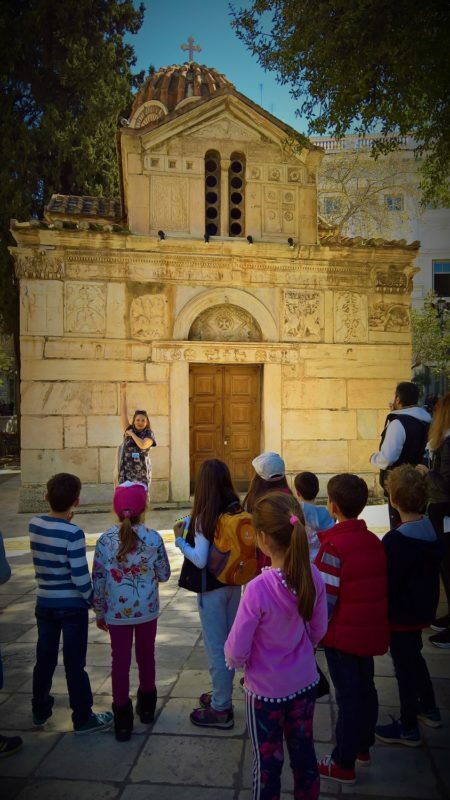 2nd stop: Visit of the small church of Panaghia Gorgoepikoos which is built over an ancient temple dedicated to the goddess Eileithyia and situated next to the Metropolitan Cathedral of Athens. 3rd stop: The Roman Agora where we will visit the Horologion of Andronikos Kyrristos – the Tower of the Winds the first Meteorological station of the ancient world. We will talk about the topography of the city during the Byzantine era and visit the Fetiye Mosque. 4th stop: The Library of Hadrian, a living monument of the coexistence of all religions! 5th and final stop -: Monastiraki square. Past, present, future!